A few generous CanDoers have agreed to fund an amazing HALF of this campaign if the CanDo community can raise the rest. It's all or nothing crowdfunding so help us get to 100%. Yes! We did it! Thank you. We are Hand in Hand for Aid and Development (HIHFAD) - a Syrian-led charity delivering humanitarian aid in Syria and neighbouring countries. After over seven years of civil war, the healthcare system in Syria is decimated. Facilities have been systematically destroyed in targeted attacks and many qualified medical staff have been forced to flee abroad. The World Health Organisation estimates that 41% of General Hospitals in Syria don’t have a midwife on staff. Shelling, roadblocks and safety concerns make it difficult for people to move freely, so even where hospitals are available, pregnant women often can’t get to them, leaving them forced to give birth at home. In many instances ‘home’ is a tent or other form of makeshift accommodation. 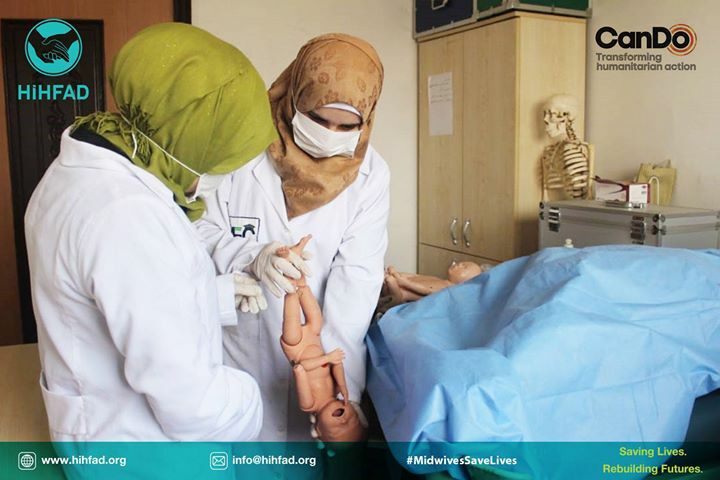 In these situations, mobile, qualified midwives save lives. If we don’t raise the money needed now, students like Crystal will not be able to complete the training they need to save the lives of mothers and their babies. Not only will your contribution make labour safer for women and children in Syria, it will also provide livelihoods and purpose to young women like Crystal, whose own lives have been devastated by war. Please contribute to our campaign to keep the school open, so that Crystal and her fellow students can save women like Amira. £15 could buy a uniform for one student midwife. £20 could buy training equipment and materials required for one student midwife for six months. £50 could provide accommodation for one student midwife attending from outside the area for three months. £100 could buy training equipment and materials for five student midwives for six months. £250 could provide training equipment and materials for the entire school of midwives for one month. £600 could cover the expenses of a specialist teacher trainer of the student midwives for one month. Since we received the funding to keep the Atmeh Midwifery school open, HiHFAD has been checking in with some of the trainees to see how their studies are progressing now they know their studies are secured. Their reactions have been phenomenal as not only can they continue to learn, but their trainers, specialists and doctors are able to pass on crucial knowledge without the stress of financial insecurity. Speaking to Barra, she explained how the funding from fellow midwives and generous CanDoers through the @CanDo Campaign has affected her. “I am a trainee at the midwifery institution in Atmeh. Prior to the current support, we faced many challenges that were impeding the continuation of the internship, but now we are very thankful for HIHFAD and the “CanDo” initiative for their support since that will help us advance through the planned internship. The knowledge and the technical capacities acquired during the internship will be invested properly when we practice the midwifery within our communities” -Barra, current Midwife in training. Thank you CanDoers, the results of your kindness will be felt for generations to come! We are delighted and honoured to share that our #MidwivesSaveLives campaign has been shortlisted for the prestigious Ockenden International Awards. These annual awards recognise work done to promote self reliance and independence of refugees and displaced persons to reduce their dependence on aid. A philosophy at the core of all of our work. Rebuilding livelihoods is the essence of the MidwivesSaveLives programme, which trains young women living in a Camp inside Syria to learn a valued profession and so support themselves and their families while rebuilding the healthcare system in their communities to ensure women in Syria don't have to go through childbirth without a trained attendant. The four prize winners, each worth £25,000 will be announced at the end of March. We are beyond delighted to hear that our campaign has reached its target and we will be able to keep Atmeh Midwife School open. Thank you from the bottom of our hearts to all the generous CanDoers and the amazing team at Can Do for keeping Crystal, Hadeel's and all of the midwife students' dreams alive, allowing them to rebuild their own lives by helping the new mothers and babies of Syria. Together we will work towards no woman in Syria having to give birth alone. Wow. We are only 2 weeks into our #midwivessavelives campaign and we have already reached over 52% of our target. Thank you so much to the generous support of 37 Candoers. We are working really hard to continue this amazing start and still need your support to reach the all important 100% target to keep Atmeh midwife school open. We've just reach the first five donations. Can we count with your help? Since we received the funding to keep the Atmeh Midwifery school open, HiHFAD has been checking in with some of the trainees to see how their studies are progressing now they know their studies are secured. Their reactions have been phenomenal as not only can they continue to learn, but their trainers, specialists and doctors are able to pass on crucial knowledge without the stress of financial insecurity. Speaking to Barra, she explained how the funding from fellow midwives and generous CanDoers through the @CanDo Campaign has affected her. “I am a trainee at the midwifery institution in Atmeh. Prior to the current support, we faced many challenges that were impeding the continuation of the internship, but now we are very thankful for HIHFAD and the “CanDo” initiative for their support since that will help us advance through the planned internship. The knowledge and the technical capacities acquired during the internship will be invested properly when we practice the midwifery within our communities” -Barra, current Midwife in training. Thank you CanDoers, the results of your kindness will be felt for generations to come! 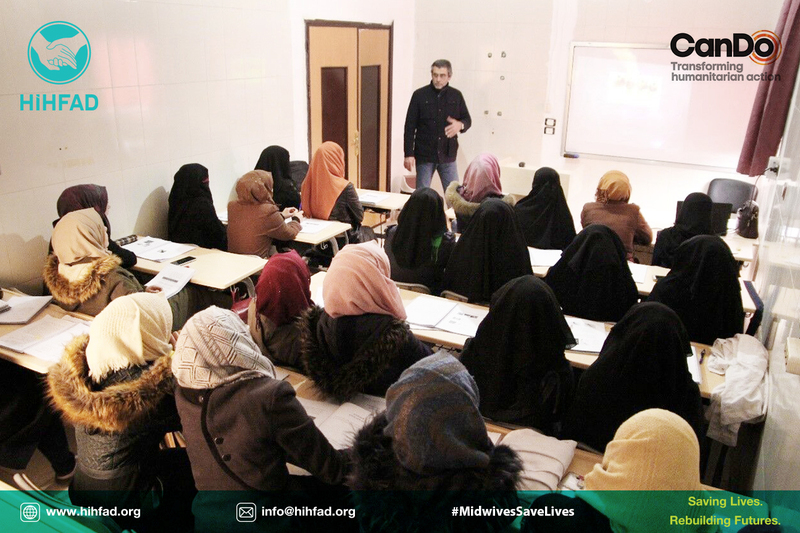 “After 5 months of uncertainty, 75 students at Atmeh Midwife School have resumed their studies confident that their funding has been secured by generous CanDoers. When their previous funding for their midwife training school ran out in September 2018 the staff at the centre believed so much in the importance of their work that all of them, teachers, directors and support staff continued their work on a voluntary basis, working for free for 5 months in the hope that funding could be secured. 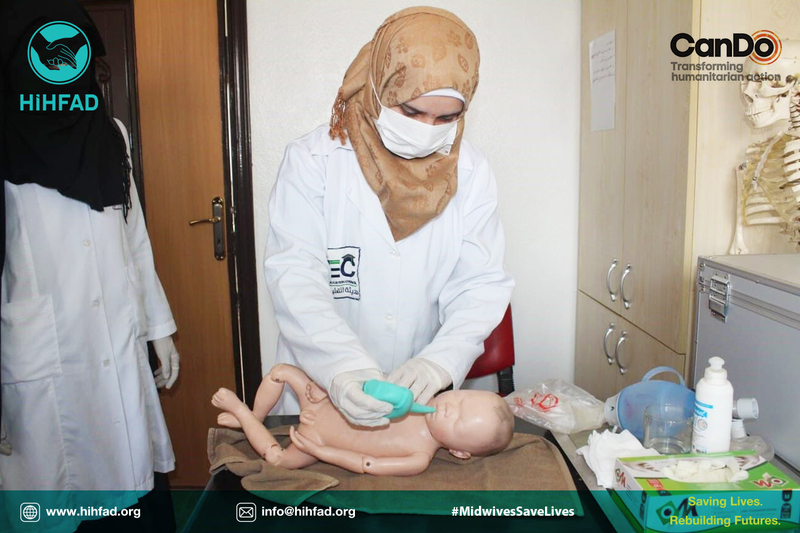 Due to the successful Can Do campaign with HIHFAD, that funding has been secured and the midwife students can continue their studies safe in the knowledge their funding has been secured. The moment her husband died is etched in Hadeel’s memory. He died in one of the many airstrikes they had endured, leaving the teenage Hadeel alone with a baby daughter, Bara, to support. Despite having been forced to drop out of high school two years earlier, Hadeel passed the baccalaureate exam with distinction after her husband’s death. With her family’s encouragement and support, Hadeel then enrolled at the Atmeh midwife school where she is now in her second year of a three year programme. “I chose this course, not only because the specialisation allows me to help other Syrian women, but because it also gives me the opportunity to support Bara with a decent life” Hadeel explained. What I love about this campaign is that it is providing skills and livelihoods to young Syrian women to support themselves and their families while they work to save the lives of other Syrian women and babies.